Welcome to the December 2018 edition of SKA eNews, a publication aimed at informing the broad community and the public about progress towards the construction of the SKA. Traditionally, newsletters at this time of the year tend to reflect on the year past, which I’ll do in a moment, but I also want to look ahead to a hopefully exciting year for the SKA. Looking into my crystal ball, I see the signing ceremony establishing the SKA Observatory as a treaty organisation; I see the official opening of the expanded SKA Global Headquarters in July; I see our biennial major science meeting in April 2019, and our regular engineering meeting scheduled for November; I also see the final element Critical Design Reviews (CDR) being completed and the year culminating in the overall SKA System CDR. I’m sure there will be numerous other milestones along the way, but these are the major ones I wish to see us accomplish and they will all be critical to enable us to proceed to SKA1 construction in 2020. If I am to highlight just one of those it must be the inauguration of MeerKAT, the 64-dish array in the Karoo, South Africa. I wholeheartedly congratulate my South African colleagues for this magnificent achievement, which they commemorated with a memorable image of the centre of our own galaxy. I was informed just this week that another milestone achieved was the submission of document #1000 into the SKA design archive. For those interested, its title was “A Model for SKA Regional Centre global size estimation” and the lead author was Rosie Bolton of SKAO. To end, I wish all our readers and colleagues a very Merry Christmas and a Happy New Year. 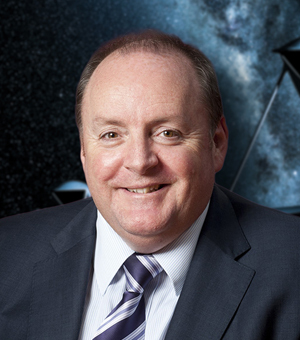 Professor Philip Diamond, SKA Organisation Director-General.